The global economy has been recovering from the 2008/09 financial crisis, albeit slow and in a haltingly manner. The longer term outlook is likely to be more of the same, with a slower growing global economy being the norm. In the decade of 2000 to 2010, the global economy expanded on average by 6% per year in real terms. Breaking down this 6% annual growth by source shows that over a fifth came from China, about a tenth from the Euro Zone, and the remaining from the rest of the world.1 In the coming decade, should China’s growth slow by one-third, the Euro Zone’s growth by fourth-fifths, and the rest of the world by two-thirds; then the global economy would expand by only 2.3% a year. If such a scenario comes about, it would be a dramatically different global economy compared with the past. Such a scenario cannot be easily dismissed because the booming global economy in the 2000 to 2010 period was driven by unprecedented liquidity, which provided a powerful lift to growth everywhere, especially in emerging markets. In 2000, private capital flow to emerging markets was estimated at US$200 billion. By 2010, it had jumped to US$1 trillion. Between 2005 and 2010, the rate of growth of private capital flow to emerging markets grew by an astonishing 478%. Indeed, in 2007 just before the global financial crisis un-folded, all but three of the 182 countries monitored by the IMF registered positive economic growth, and 114 of them grew by 5% or more, a phenomenon never seen before. In the two decades prior to 2007, only 50 countries had managed to grow by 5% or more, and most of them for only a few years at a time. So the decade of 2000 to 2010 is in many ways unique and a repeat performance is highly unlikely. For many markets in Asia/Pacific and the Middle East, especially the export-oriented ones, the outlook of a slower growing global economy will mean weaker demand for exports. As summarized in Table 1, among these markets total merchandise exports as a percent- age of GDP in 2011 ranges from as high as 176% and 159% in Hong Kong and Singapore respectively, to 14% in Japan. Trade within the Asia/Pacific accounted for the lion’s share of their total exports, followed by exports to North America and Europe. Weaker global demand in the future will mean slower growth in ex- ports at best for many of these markets. How would a weaker global economy, hence a slowdown in exports affect the level of consumer confidence in Asia/Pacific and the Middle East? This is not an academic question, but one with far-reaching practical consequences. With external demand weakening, domestic demand becomes an important factor in sustaining economic growth; and private domestic consumption is an integral part of domestic demand. To the extent that private domestic consumption is affected by consumer confidence (lower consumer confidence leading to less private consumption), then the resilience of the latter in the face of weak exports will be very beneficial in sustaining growth. Chart 1 illustrates that there is indeed a prima facie correlation between levels of ex ports and consumer confidence as measured by the MasterCard Worldwide Index of Consumer Confidence (MWICC). In this report, an Index of Resilience is constructed to assess the extent to which consumer confidence is correlated with merchandise export growth –– the higher the correlation, the more vulnerable consumer confi- dence is to a slowdown in merchandise exports. On the other hand, if the correlation is shown to be low, then consumer confidence is less affected by a slowdown in exports, and therefore it can be considered to be more resilient. Launched in 1993, the MWICC has the advantage of being the longest running regional consumer confidence survey in Asia/Pacific; thus there are long data series that can be used for sufficiently rigorous correlation analysis. Currently, there are 25 markets covered by the bi-annual MWICC survey. However, only 17 of these 25 markets are included in the Index of Resilience. The markets that are excluded from the analysis are those whose coverage by MWICC is of relatively recent vintage. The correlation analysis is conducted between merchandise export growth and overall consumer confidence level, as well as separately with the five dimensions of consumer confidence: economy, employment, regular income, stock market, and quality of life. The additional analysis at the level of the five dimensions, which collectively constitute the overall consumer confidence, provides more specific insights on how a change in merchandise exports may affect consumer confidence in the market in question. For example, two markets, A and B, may have similar level of merchandise exports as a percentage of GDP, but differ significantly in the diversity of their exports. In market A, for instance, most of exports may come from a single sector (oil for instance), whereas in market B exports are broadly based on many sectors (a mix of manufacturing, commodities and capital goods). Consequently, with a similar drop in demand for their exports, the effects may be very different between A and B. In market A, the impact on the economy and the stock market could be more severe than the impact on employment and regular income, if the sole export sector is very capital intensive and dominates the valuation in the stock market. In contrast, a similar drop in demand for exports in market B may create more stress in employment, regular income and thereby the quality of life, if the many sectors that participate in exports are labor intensive, but are not very dominant in the valuation of the stock market. Such differences between markets A and B would be reflected in differences in the correlation coefficients between merchandise export growth and the five dimensions of consumer confidence. Thus, the secondary correlation analysis at the level of the five dimensions of consumer confidence yields a more nuanced and market-specific picture on how changing global demand for exports would affect consumer con fidence in different markets in spite of similar dependence on exports. Details of analysis are described in Section 4. Chart 2 presents the outcome of the correlation analysis at the overall consumer confidence level through color-coding the markets. Markets shown in red are those with a correlation coefficient larger than 0.5, suggesting that their consumer confidence is very vulnerable to a slowdown in demand for its exports. At the other end of the spectrum, markets shown in blue are those with correlation coefficient less than 0.2, suggesting that their consumer confidence is very resilient to any weakening demand for exports. In between are the color codes of orange (relatively vulnerable), yellow (neutral – neither vulnerable nor resilient), and green (relatively resilient), representing correlation coefficients of 0.4-0.5, 0.3-0.4, and 0.2-0.3 respectively. China and India are found to be at roughly the mid-point (neutral) between very vulnerable and very re- silient in their consumer confidence, with the correlation coefficients estimated to be 0.37 and 0.34 respectively, as shown in Chart 3. At first glance, the results may seem counterintuitive as China is so much more export oriented than India. However, both China and India have very large domestic markets, and their merchandise exports as a percentage of GDP are not that different: 26.1% in China and 18.7% in India (though China’s GDP is more than four times larger). Thus, consumer confidence in both markets is affected by export performance only to a limited degree. Their large domestic markets suggest that there are other important domestic determinants of consumer confidence, and it is not easily eroded by a decline in their exports. Compared with China and India, the correlation between merchandise export growth and consumer con fidence is higher in both Australia and New Zealand, as shown in Chart 4. Their correlation coefficients are estimated to be 0.41 and 0.45 respectively, putting them in the relatively vulnerable category. It is well known that Australia’s exports of resource and commodities to China have become the single most important driver of its economy in recent years, so it is not that surprising that consumer confidence in Australia is well correlated with its merchandise exports. Consumer confidence in New Zealand, however, turns out to be more vulnerable than Australia to a slowdown in export growth. Consumer confidence in Japan, South Korea, and Taiwan exhibit very different correlations with their respective merchandise exports. As seen in Chart 5, Japan’s correlation coefficient is 0.24, putting it in the relatively resilient category. South Korea, at 0.47, is in the relatively vulnerable category. Taiwan, on the other hand, is in the neutral category. In spite of having a higher export to GDP ratio of 66.6% than South Korea’s 50.4%, Taiwan’s consumer confidence is less vulnerable to a slowdown in exports than South Korea. Chart 6 shows a sharp contrast between Singapore and Hong Kong, in spite of their similar, and very high, export to GDP ratios (158.6% and 176.4% respectively). While both are small, open, and trade-oriented economies, Singapore is in the very vulnerable category whereas Hong Kong is in the relatively resilient category. This contrast illustrates that consumer confidence in dif ferent markets can be sustained by very different market specific factors, resulting in significant differences in the resilience of their consumer confidence in re sponse to a slowdown in exports. The correlations between consumer confidence and merchandise exports in the five key Southeast Asian markets are summarized in Chart 7, which show very different results. Malaysia and Vietnam are in the relatively vulnerable category with correlation coefficients of 0.47 and 0.49 respectively. And they both have high merchandise export to GDP ratios; 81.5% in Malaysia and 75.2% in Vietnam. Indonesia and Thailand are in the neutral category, with identical correlation coefficient of 0.32, even though they differ significantly in their export to GDP ratios: 24.1% in Indonesia and 65.5% in Thailand. Philippines stands out in the relatively resilient category with a correlation coefficient of 0.29. And its export to GDP ratio is also relatively low at 22.6%. The correlations between consumer confidence and merchandise exports in the three Middle East markets of Saudi Arabia, United Arab Emirates (UAE), and Kuwait are shown in Chart 8. All three are in the very vulnerable category with coefficients higher than 0.5. At 0.87, the correlation coefficient of UAE is the highest among all 17 markets covered. In spite of concerted efforts to diversify its exports away from resource and commodities, notably in Dubai’s investment in becoming a tourism and convention hub, UAE’s merchandise export to GDP ratio, at 66.8%, remains higher than 57.3% in Saudi Arabia and 44.2% in Kuwait. Table 2 summarizes the ranking of the 17 markets in terms of the Index of Resilience of Consumer Confidence. Japan and Hong Kong are in the first rank with the lowest correlation coefficient of 0.24, whereas UAE is in the last rank with the highest correlation coefficient of 0.87. Philippines ranks second behind Japan and Hong Kong. Indonesia and Thailand tie for the third rank, while Taiwan and India come in fourth and China ranks fifth; all five are in the neutral category. The next five markets are Australia in sixth rank, New Zealand in seventh, South Korea and Malaysia in eighth, and Vietnam in ninth; and they are in the relatively vulnerable category. Finally, four markets are in the very vulnerable category: Singapore in tenth rank, Saudi Arabia in 11th, Kuwait in 12th, and UAE in 13th. Chart 9 shows graphically the color codes of the corre lation coefficients of the 17 markets in terms of how merchandise export growth would affect consumer confidence in the state of the economy (the economy dimension of the overall consumer confidence index). All color codes are present with the exception of blue (very resilient). For most of the 17 markets, the correlation coefficients between (i) export growth and overall consumer confidence, and (ii) export growth and confidence in the state of the economy, are similar. Singapore, however, shows that its confidence in the state of the economy is more vulnerable to a slowdown in merchandise exports than its overall consumer confidence; the coefficient of the latter being slightly higher at 0.54 than the former at 0.50. Hong Kong, Taiwan, Thailand, and Vietnam, on the other hand, show an opposite tendency of their confidence in the state of the economy with this being more resilient to a slowdown in merchandise exports than their overall consumer confidence. Chart 10 illustrates the color codes of the coefficients between merchandise export growth and the employment dimension. All color codes are present, ranging from very vulnerable to very resilient. Nine of the 17 markets exhibit more resilient consumer confidence in their employment situation than the overall consumer confidence. In fact, in Japan consumer confidence in employment is in the very resilient category, a reflection of the sense of security in employment in Japan. Japan is followed by Hong Kong, China, India, Philippines, Taiwan, and Thailand; all with consumer confidence in the employment dimension showingstronger resilience than their overall consumer confidence, securely in the relatively resilient category. UAE’s consumer confidence in the employment dimension, though slightly more resilient than its overall consumer confidence, is also in the very vulnerable category. In contrast, consumer confidence in the employment dimension is less resilient in Australia (relatively vulnera ble), Malaysia (relatively vulnerable), Singapore (very vulnerable) and Vietnam (very vulnerable) compared with overall consumer confidence. The correlations between merchandise export growth and the regular income dimension of consumer confidence are shown in color codes in Chart 11. The entire range of color codes is present, from as low as 0.10 (very resilient) in India to as high as 0.72 (very vulnerable) in Saudi Arabia. Consumer confidence about their regular income is more vulnerable than overall consumer confidence in China, Kuwait, Philippines, Saudi Arabia, and Vietnam. In contrast, it is more resilient than overall consumer confidence in Australia, India, Indonesia, Japan, South Korea, New Zealand, and Singapore. The correlations between merchandise export growth and consumer confidence in the stock market are shown in Chart 12. China has the lowest correlation at 0.20 (very resilient), suggesting that changes in merchandise export do not much affect its stock markets. Kuwait, on the other hand, shows the highest correlation at 0.74 (very vulnerable), indicating that its stock market is very sensitive to changes in Kuwait’s merchandise exports (primarily oil). Consumer confidence in the stock market in China, South Korea, and Saudi Arabia is more resilient than overall consumer confidence; whereas the reverse is the case for Hong Kong, Japan, Kuwait, New Zealand, Singapore, and Thailand. Chart 13 presents the correlations between merchandise export growth and consumer confidence regarding quality of life. The lowest correlation coefficient is found in Japan at 0.13 (very resilient), suggesting that Japanese consumers do not see much impact from a change in merchandise exports in their quality of life. At the other end of the spectrum is Kuwait with the highest correlation coefficient at 0.56 (very vulnerable), implying that Kuwaitis believe that their quality of life is closely intertwined with oil export. 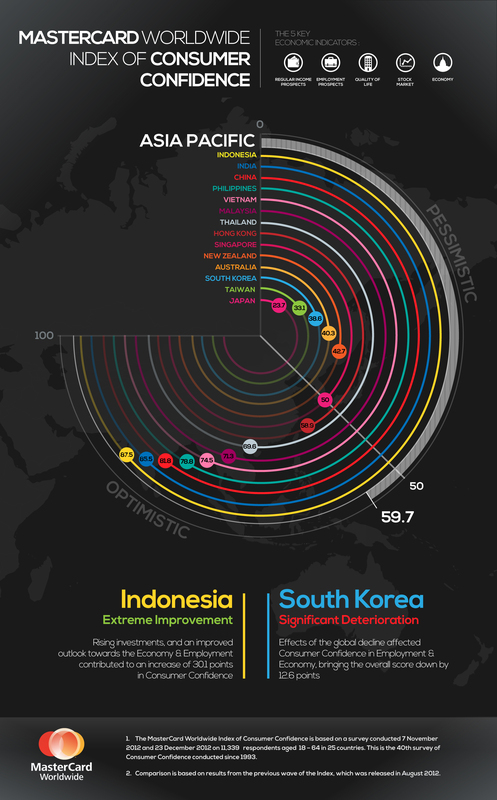 Along with Japan, consumer confidence with respect to their quality of life in Malaysia, New Zealand, Saudi Arabia, Singapore, Taiwan, Thailand, and Vietnam is more resilient than overall consumer confidence; whereas the opposite is true in Kuwait and Philippines. As summarized in Table 3, while the overall consumer confidence in Australia is relatively vulnerable to a slowdown of its merchandise exports, consumer confidence is more resilient with respect to regular income and the stock market, suggesting that these two dimensions are less affected by changes in exports. Consumer confidence regarding the economy and employment, however, mirror the overall consumer confidence, and both are relatively vulnerable to a decline in exports. Hong Kong’s situation is summarized in Table 4. In spite of a small, open, and trade-oriented urban economy, Hong Kong’s overall consumer confidence is relatively resilient to a slowdown in merchandise exports. Its consumer confidence regarding the economy is actually very resilient, suggesting that consumers in Hong Kong do not see exports as the most important determinant of their economy, employment, regular income; nor does it unduly affect its stock market and the general sense of quality of life. The five dimensions of consumer confidence in China behave very differently with respect to merchandise exports as seen in Table 5. Consumer confidence about the economy and quality of life closely track their overall confidence (neutral). But Chinese consumers see their regular income being highly affected by changes in exports, and less so for employment; and they see their stock markets being relatively unrelated to export performance. While India’s overall consumer confidence is in the neutral position with respect to merchandise export growth, consumer confidence regarding employment and regular income are stronger in the relatively resilient and very resilient categories as Table 6 shows. It can be concluded that consumer confidence in India is either unaffected by or relatively resilient to changes in its merchandise exports. This is consistent with India’s less export-oriented economy. Table 7 shows the situation in Indonesia, like India, where consumer confidence is relatively unaffected by or relatively resilient to changes in its merchandise exports. This is in spite of Indonesia being a strong ex- porter of resources and commodities. Indonesia’s very strong private consumption growth in the last decade,which became a key driver of overall economic growth as well as employment and income generation, may be the explanation. In other words, Indonesia has well-balanced support from both exports and domestic consumption in its economic growth. Japan exhibits a generally resilient profile in its consumer confidence in regard to merchandise exports as seen in Table 8. This should not come as too much of a surprise as Japan’s domestic consumer market is second only to the US, and in the past two decades leading exporters have been investing and building production capacities overseas instead of in Japan. The one dimension that shows a stronger connection to exports is Japan’s consumer confidence regarding the stock market. This reflects the dominance of large Japanese corporations with strong exports in the stock market. It should also be noted that Japan’s consumer confidence has been chronically weak, stuck in the pessimistic range for over a decade; which in turn suggests that its exports performance, weak or strong, is largely irrelevant to Japan’s consumer confidence; which is clearly more affected by domestic factors. Table 9 shows South Korea’s consumer confidence being relatively vulnerable to changes in its merchandise exports. While consumer confidence regarding the economy, employment and quality of life track the overall consumer confidence; consumer confidence regarding regular income and the stock market appears to be less affected by changes in merchandise exports. Kuwait’s consumer confidence profile, as seen in Table 10, is one of vulnerability to its merchandise ex port (oil). The least vulnerable is consumers’ perception of their quality of life, which is in the relatively vulnera ble instead of the very vulnerable category. Malaysia’s consumer confidence profile is similar to Kuwait’s, albeit showing slightly less vulnerability to a slowdown in its merchandise exports, as Table 11 shows. New Zealand’s consumer confidence profile exhibits relative vulnerability in all but the regular income dimension, as summarized in Table 12. Apart from this one exception, it is very similar to that of Malaysia. New Zealand’s consumer confidence regarding regular income being more resilient is likely due to its more generous social welfare support, which acts as a buffer that cushions the impact from any slowdown in merchandise exports. Table 13 shows that the Philippines has a relatively resilient profile in its consumer confidence in relation to merchandise exports. The weakest are with respect to the regular income and quality of life dimensions (both are in the neutral category). Consumer confidence in Saudi Arabia is very vulner able to any slowdown in its merchandise export (oil), as shown in Table 14. The least vulnerable is Saudi Arabians’ confidence in their quality of life, which is the least affected by exports. Singapore’s consumer confidence is generally vulnerable to its merchandise exports, with the sole exception of confidence in quality of life, which is relatively resilient to potentially negative impacts from a slowdown in exports. As seen in Table 15, consumer confidence regarding regular income is also less affected by exports, being in the neutral category. Taiwan has a more resilient profile in its consumer confidence in relation to merchandise exports, as Table16 shows. The most vulnerable is in the stock market dimension, which reflects the dominance of large and export-oriented Taiwanese companies in its stock market. Thailand also exhibits a relatively resilient profile of its consumer confidence in relation to its merchandise exports. The resilience of Thai consumer confidence is weakest in the two dimensions of regular income and stock market as Table 17 shows; both are in the neutral category. None of the five dimensions of consumer confidence are in the vulnerable category with respect to merchandise exports, however. Consumer confidence in the UAE is very vulnerable to a slowdown in its merchandise exports, as Table 18 shows. In fact, the correlation coefficients in the UAE are the highest seen in the 18 markets, suggesting that even a minor slowdown in its merchandise exports could quickly erode consumer confidence. Vietnam’s consumer confidence is relatively vulnerable to a slowdown in its merchandise exports as seen in Table 19. It is most vulnerable in the employment and regular income dimensions, and less so in when it comes to consumer confidence regarding the economy and their quality of life. Resilience of consumer confidence is one of the factors that determine the potential of domestic consumption as a growth engine in a slower growing global economy. The other important factor is the strength of consumer confidence to begin with. Combining these two factors then positions each of the markets in a two dimensional matrix indicating their potential in leveraging private domestic consumption. Markets with the strongest potential are those with the highest level of consumer confidence, as well as most resilient to a slowdown in merchandise exports. At the opposite end of the spectrum are markets with least potential, which are those with very low consumer confidence, and are also most vulnerable to a slowdown in merchandise ex- ports. Chart 14 positions each of the markets in such a two dimensional matrix. Markets with the greatest potential are in the upper left corner, and those with least potential are in the lower right corner. Hong Kong, Indonesia, Thailand, Philippines, India and China are well positioned with the strongest potential to leverage private domestic consumption to support economic growth. While Malaysia, Singapore, Vietnam, Saudi Arabia and Kuwait all have relatively strong consumer confidence; their consumer confidence is also more vulnerable to a slowdown in merchandise exports. Japan’s consumer confidence is very resilient to external shocks, but it is also very low, being stuck in pessimism for over a decade and a half, which is a persistent damper on private consumption. The UAE occupies a position all on its own, with historically strong consumer confidence while being very vulnerable to a slowdown of its exports. The objective of this project was to investigate the degree to which consumer confidence in key markets in Asia/Pacific and the Middle East is correlated with their exports. Lower correlations indicate higher resilience as the market in question is less affected by weakening external demand. To that end, a correlation analysis of the MasterCard Worldwide Index of Consumer Confidence (MWICC) and its 5 sub-components was conducted against merchandise export growth for 17 countries across Asia/Pacific and the Middle East. Domestic consumer confidence data was sourced from The MasterCard Worldwide Index of Consumer Confidence survey. It is the most comprehensive and longest running (20 years) survey of its kind in the region. The survey comprising the Asia/Pacific markets began in the first half of 1993 and has been conducted twice yearly since. Markets from the Middle East and Africa were included in the Index from 2004. Twenty five markets now participate in the survey: Australia, China, Egypt, Hong Kong, India, Indonesia, Japan, Kenya, Kuwait, Lebanon, Malaysia, Morocco, New Zealand, Nigeria, Oman, Philippines, Qatar, Saudi Arabia, South Korea, South Africa, Singapore, Taiwan, Thailand, United Arab Emirates and Vietnam. The Index is calculated based with zero as the most pessimistic, 100 as most optioptimistic and 50 as neutral. Five dimensions associated with consumer confidence are measured: employment, the economy, regular income, stock market and quality of life. The responses are consumers' outlook for the six months ahead. Data collection was via internet surveys and face to face interviews, with the questionnaire translated to the local language wherever appropriate and necessary. The survey has a margin of sampling error of plus or minus four to five percentage points at the 95% confidence level. The time period of the correlations was constrained by the MWICC time series and varies by country. The cor relations for Australia, Hong Kong, Indonesia, Japan, Korea, Malaysia, New Zealand, Singapore and Taiwan used the period 1993 to 2012; India, Philippines and Thailand used the period 1995 to 2012; China used the period 1996 to 2012; Vietnam used the period 2003 to 2012; and Kuwait, UAE and Saudi Arabia used the period 2004 to 2012. Although 25 countries are covered by the MWICC, 5 of the countries were excluded from the correlation analysis due to insufficient data points as these countries joined the survey much later (Kenya (2009), Nigeria (2009), Morocco (2009), Qatar (2008), Oman (2011). As the MWICC is surveyed on a biannual basis, exports were aggregated at 6 month intervals to produce cor- responding biannual points in 3 versions: 6 month leading, coincident and 6 month lagging. Finally, in addition to total merchandise exports, regional export series were also created. Correlation analysis of the overall MWICC Index score and its 5 components were conducted separately against the 6 month leading, coinci dent and 6 month lagging biannual export growth of total merchandise exports and on a regional export basis to ascertain which of the three versions would give the best correlations. At this point, three countries were excluded from the analysis as correlations were negative for all three versions (Lebanon, Egypt and South Africa). The table below shows the export version selected (coincident, 6 month leading, or 6 month lagging) based on the best correlations produced. This indicator was used as a guide to the overall impor tance of exports to the economy. Merchandise exports at the total and at the regional level were calculated for each country for the 2011 period and the average of the 1993 to 2011 period. The ratios vary widely across the countries with Japan, Australia and India in the sub 20% range at one end of the spectrum and Singapore and Hong Kong at the other. When mapped against the correlations of total merchandise exports to the MWICC index over 1993 to 2011, the relationship of a higher ratio of exports to GDP giving higher correlations of exports and domestic consumer confidence is not always maintained. Some countries like Hong Kong, Taiwan and Thailand have a very high ratio of merchandise exports to GDP but a relatively low correlation of merchandise export growth to domestic consumer confidence, while countries like Australia and New Zealand have a lower ratio of merchandise exports to GDP but a relatively higher correlation of merchandise export growth to domestic consumer confidence. Details of the correlation analysis are summarized in the following table.